India's foreign minister says he will "not rush" into talks with his Pakistani counterpart to defuse military tensions in Kashmir. Salman Khurshid's remarks came after Hina Rabbani Khar's call for a dialogue between the two ministers. The two armies have agreed to "de-escalate" tensions along the Line of Control (LoC) after a meeting of their chiefs of operations. Tensions have risen following deadly exchanges along the border last week. The violence has plunged the neighbours into the worst crisis in relations since the Mumbai attacks of 2008, blamed on militants based in Pakistan. Ms Khar said on Thursday that the recent border clashes had "created questions", adding that Pakistan was "open" to dialogue between foreign ministers to end the dispute. "Let us not rush into the matter and [let us] move step by step," Mr Khurshid said. "Direct talks between countries don't come up in a jiffy; you sort of work up gradually or work towards something," the Indian foreign minister was quoted as saying by the Hindustan Times newspaper. On Wednesday the Pakistani army's director of military operations agreed to the de-escalation after calling his Indian counterpart to "protest strongly" against a "ceasefire violation" by Indian soldiers that killed a Pakistani soldier along the LoC on Tuesday night. India has denied the allegation, which comes after separate incidents last week in which two Indian soldiers and two Pakistani soldiers died. 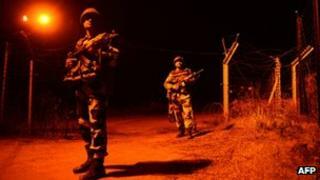 The Pakistani commander said strict orders had been passed to troops on the LoC to observe a ceasefire that has been in place since 2003, a spokesman for the Indian army, Col Jagdeep Dahiya, told the BBC. Both sides deny provoking the clashes, amid fears that a fledgling peace process under way since February 2012 could unravel, says the BBC's Sanjoy Majumder in Delhi. On Tuesday, Indian PM Manmohan Singh said the killing of the Indian soldiers last week - one of whom India says was beheaded - was "unacceptable". Claimed by both countries, Kashmir has been a flashpoint for over 60 years and two wars have been fought over it. Exchanges of fire in the disputed area are not uncommon but rarely result in fatalities.